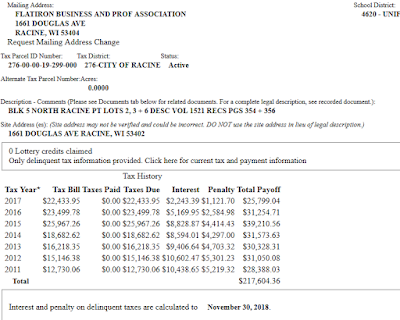 I am concerned that a Business, located at 1661 Douglas Ave., known as Flatiron Village Mall, has a license from City of Racine to operate a Gambling Hall - a BINGO operation, yet has not paid the property taxes due since 2011, and is currently, according to Racine County records, $217,604.36 in arrears. In addition, the building, affiliated with the non-profit Northside Redevelopment Project Inc, is being allowed to blight the neighborhood, as proper maintenance has not been attended to. Note that former County Supervisor Ken Lumpkin is the Chairman - from the referenced 2017 Form 990. Why is a BINGO Hall allowed to evade paying their property taxes from 2011 to the present, thus forcing the cost on others, allow the property to deteriorate, and yet still retain a privileged business operating license? 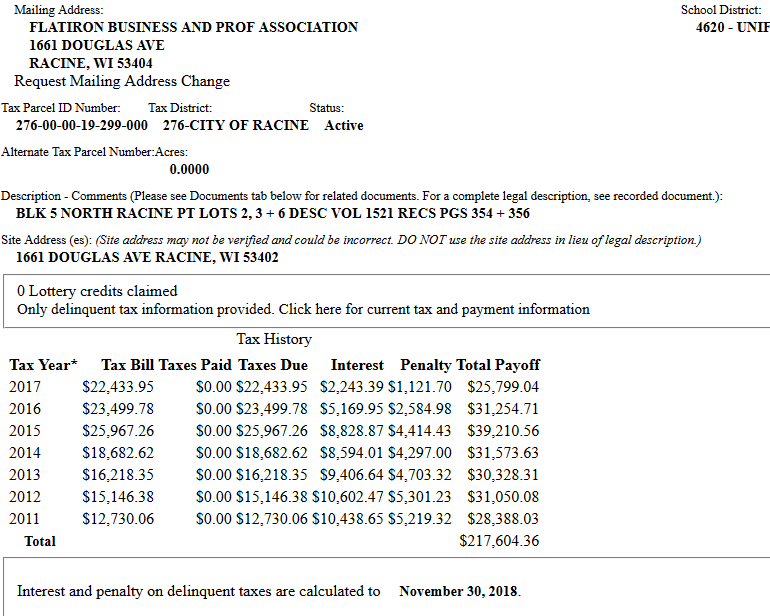 And the Chairman of the Flatiron Business and Prof Association is none other than former County Supervisor and occasional Talking Racine Panelist Ken Lumpkin - per the Organizations form 990. And the proceeds from the BINGO games, after prizes, are donated back to..... Flatiron Business and Prof Association!